Sometimes I forget how much fun it is to stamp. I mean look the magazines are loaded with ways to make cards using papers and scrapbook embellishments and that is all great. Sometimes, though just the act of simply stamping an image, coloring it and letting it be the central focus of what you are making is refreshing. 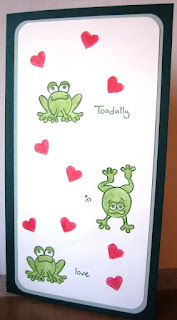 This is one of those cards, it is a Valentine for my husband and it is "toadally" simple! No ribbons, brads, rub-ons or buttons. Just some plain images, on plain cardstock, layered on plain paper. It's cute, it's quirky and best of all it was FUN to make!!! I am so tired of feeling stressed over papers and colors and layering. I am going back to stamping for the fun of it. I mean come on, frogs, er, toads for Valentines day! No matter what you stamp, make it fun and have fun doing it. Stamping or scrapping should be about getting pleasure from something you enjoy. It shouldn't be about pressure to be perfect or for everything to match. If you aren't having fun doing it, why do it! I toadally love this card!!! Those toads are too cute. That is so cute!! and you're right, sometimes we get caught up in all the "stuff" we forget to just stamp! I've been trying to figure out how to make it look like those frogs were jumping - now I got it! Cute cute cute! KWYM, sometime simple is also amazing. This little card is way cute BTW, TFS!!! I love the little frogs and hearts. This is adorable. Too true, but I have been loving the bliss paper because I can get everything to match quickly! Very cute Angie. I know what you mean about stamping being for fun. Sometimes you get hung up on technicalities and it just takes the fun out. Great card!